Larisha Campbell and Andrew Bernard are the creative duo behind We’re Parents, a resource full of recipes, travel inspiration and general parenting topics. They’re also mom and dad to two daughters who are adventurous eaters, but can be picky at times. In an effort to make sure the girls are getting nutrition-packed meals, they get creative with how to incorporate fresh, healthy ingredients. “I saw a recipe for Baked Chicken Monterey on Tasty from a TODAY Food Club Challenge,” says Campbell. She used the recipe as inspiration for her own dish that uses seasoned and sautéed chicken to top a creamy chicken and broccoli alfredo. Her sauce swaps in Greek yogurt and pureed cauliflower for traditional cream or milk. Check out her recipe below. Cut chicken breasts into bite sized cubes and season with garlic powder, onion powder, paprika and Italian seasoning. Sauté seasoned chicken pieces in oil until cooked through. In a pasta pot, cook pasta according to package instructions. With about five minutes left, add chopped broccoli florets to the boiling water to cook. Steam cauliflower for about 10 minutes until soft. Transfer cooked cauliflower to a blender, adding Greek yogurt, salt and pepper to taste, Campbell’s Cream of Chicken Soup, garlic cloves, Parmesan cheese and butter, blending until smooth. If the sauce looks too thick, slowly add cooking liquid (water or Swanson’s broth) to thin out. 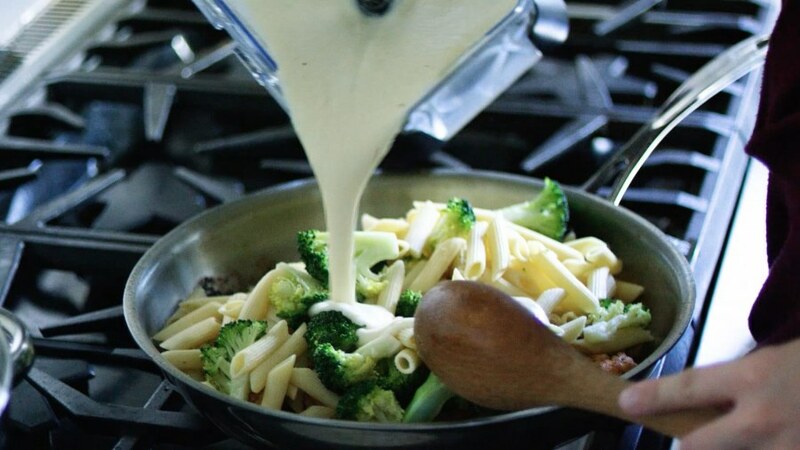 In a large skillet or serving dish, combine the cooked pasta, broccoli and chicken with the sauce.